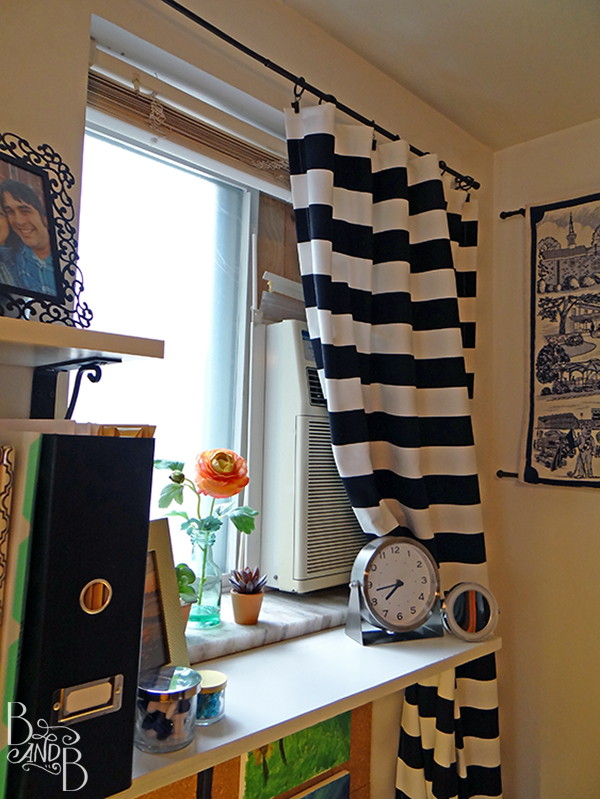 We’re DIY Lovers who live in a rented apartment. So while we have a wonderful landlord who is generally very understanding and welcoming of many types of projects, we can’t do fun things like add a tile back-splash to the kitchen, install crown molding, or paint the walls something other than the same white paint that covers the ceiling, trim, walls, and even some cabinets. So.Much.White.Paint. We recently began a lengthy update to a corner of our bedroom, turning it into an office space with a clean, white desk and shelves. Trouble was, while I was trying to go for that clean white feel, it started looking REALLY white. TOO white really. This photo above shows how all that white was really looking BORING. 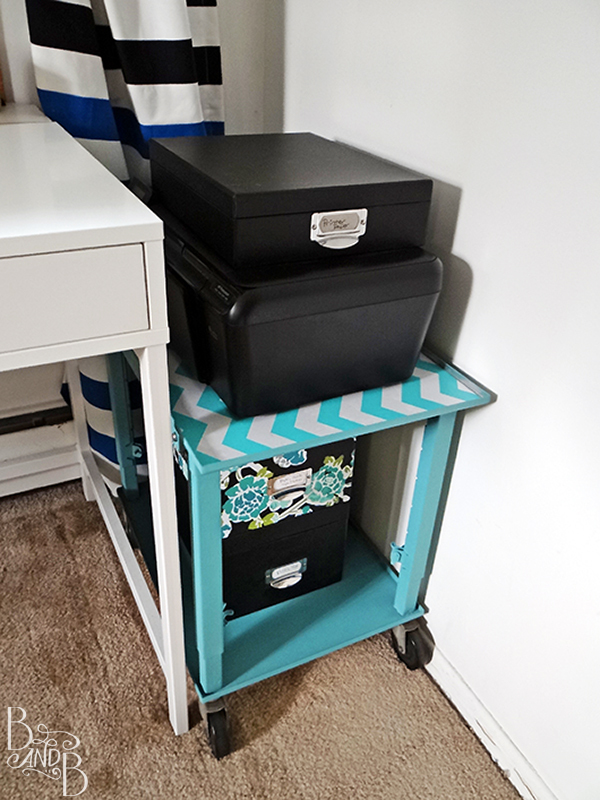 So I added a bold, striped curtain and a printer cart in a fresh pop of teal. These were a great start, but we needed something…… more. Especially that space beneath the shelf and above the desk surface. Something that would add more warmth to the space, and maybe some additional function too. Enter my friend, CORK! Cork is a light-weight and has a great natural visual texture to it. 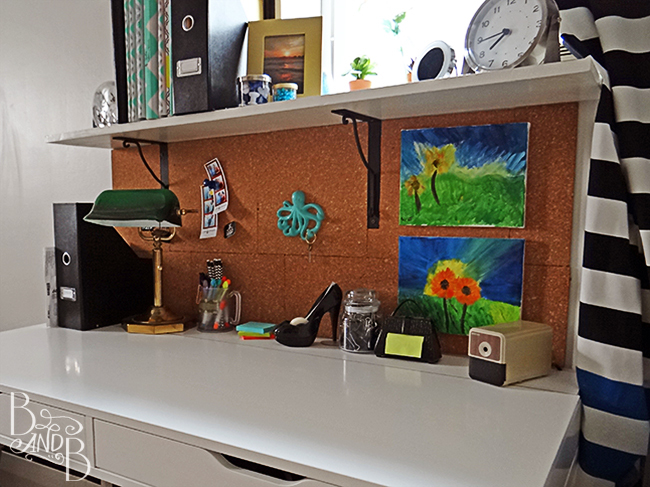 Plus they’re obviously handy near a work-space because, duh, corkboard! This set came with 4 tiles, plus mounting squares to easily hang them. You can use the included squares, or if you’re worried about them being difficult to remove when you move, you can also use the same command strips for hanging posters here too. I had to get a little fancy cutting the squares to fit around the brackets of the shelves, but that was easily completed with scissors alone, and in about 15 minutes I had a new wall of cork above the desk! Tuh-dah! The warm cork actually makes all that white POP now. And it makes for a handy place to keep photo booth strips, and even my horde of Shutterfly coupons (Not pictured, because clutter). Want to try it out yourself? Check out these affiliate links and pick up the goods for your own space!